Gutter Covers are an important component of all rain gutter systems. 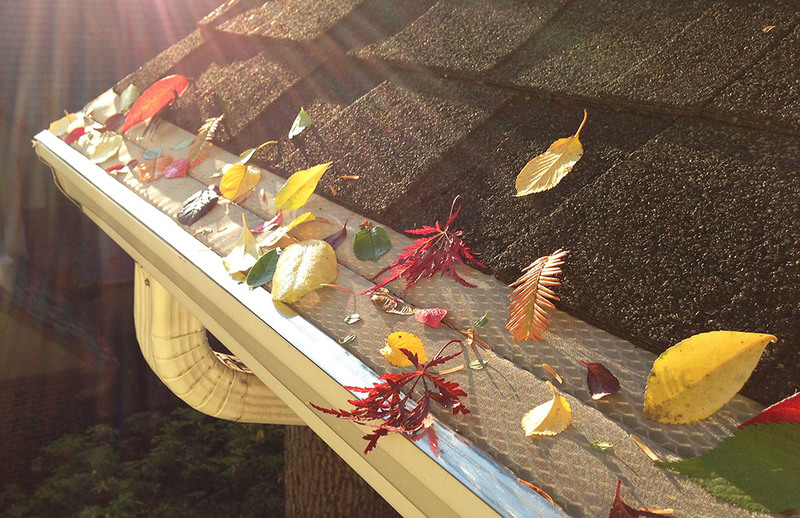 We recommend gutter covers for all rain gutters, even if there are no trees nearby. As well as keeping your gutters clear and free of leaves and pine needles, gutter covers also help to control ice and snow. Gutter covers draw the suns warmth to promote ice melting. Snow often stays on top of gutter covers, instead of going into the gutter. This helps gutters stay clear to drain roof run off. “In February a customer called with an observation he made in his neighborhood. This winter there had been many snow storms, with drastic changes between above and below freezing temperatures. The perfect weather conditions to form ice on the roofs of homes. 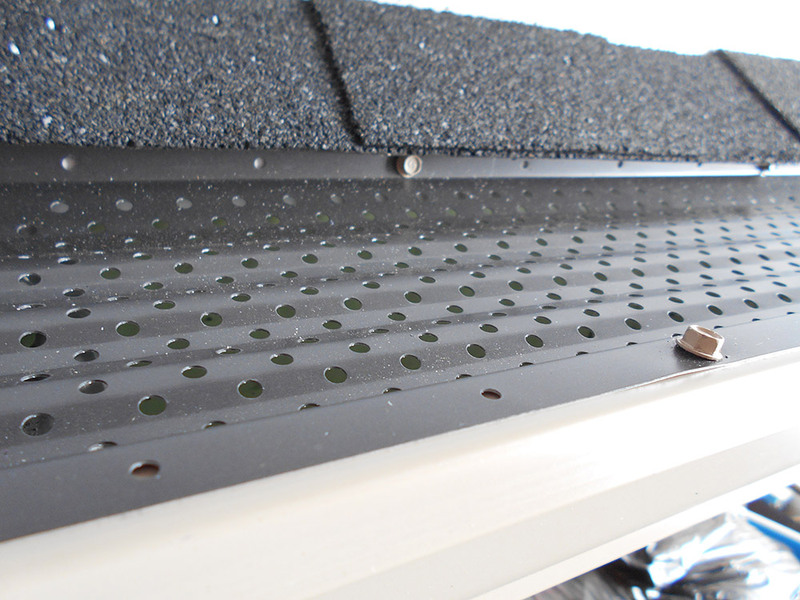 The three main types of gutter covers are solid perforated, micro-screen, and reverse curve. We do not endorse any one type of cover as the best in all situations. Each type of cover has it’s own characteristics, making different covers work better in different situations. All types of covers can be heated for superior prevention of ice build up. We work with you to choose the best cover for your gutters. Solid Perforated Covers also known as “drop in covers”, are economical as well as functional. The covers are made from aluminum, having holes or perforations throughout the cover, which allow water into the gutter while keeping leaves and debris out. The covers are attached to the outside edge of the gutter with stainless steel screws, and often attached to the face board for added strength. Solid perforated covers are effective against leaves, ice, and snow. The covers are extremely strong making them a top choice if roofs are to be raked in the winter months. The covers are available in white and dark bronze colors, and are not visible from the ground. We recommend installing a dark colored cover to draw the suns warmth, helping to melt ice and snow. Gutter covers can be heated for superior prevention of ice build up. Many covers carry a manufacturers 20 year “no clog” warranty. Micro Screen Gutter Covers have become very popular in recent years. Micro screen covers are often comprised of an aluminum frame, which is covered with a very fine stainless steel screen. Some micro screen gutter covers install flat on top of the gutter similar to a drop in cover, attaching to the outer edge of the gutter and face board. These covers are not visible from the ground. Some micro screen gutter covers install at a sloped angle, attaching to the outside edge of the gutter and sliding under the homes roofing. This type of installation helps keep the cover clear of leaves, pine needles and debris. 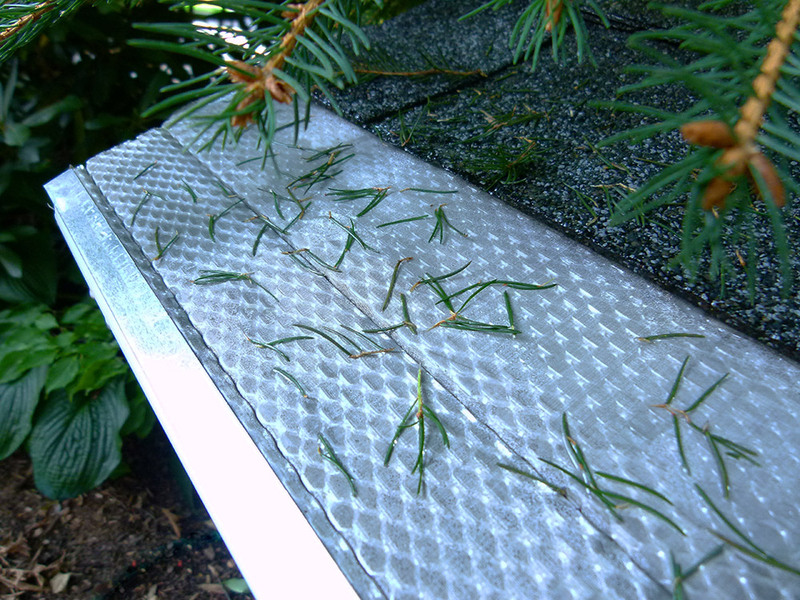 All water goes through the screen into the gutter; leaves, pine needles and debris wash over the gutter. Micro screen covers are very effective on all debris including pine needles and leaves. Micro screen covers can be heated in the Winter months. There are many brands of micro screen covers to choose from. Many have manufacturers lifetime warranties that are transferable. We will work with you to choose the best micro screen cover for your gutters. Reverse Curve Gutter Covers are a solid aluminum cover that slides under a homes roofing and attaches to the outside edge of the gutter. The cover has a curve at the outside edge of the gutter with open slots at the bottom edge. Rainwater goes through the open slots into the gutter, while leaves and debris wash over the gutter. 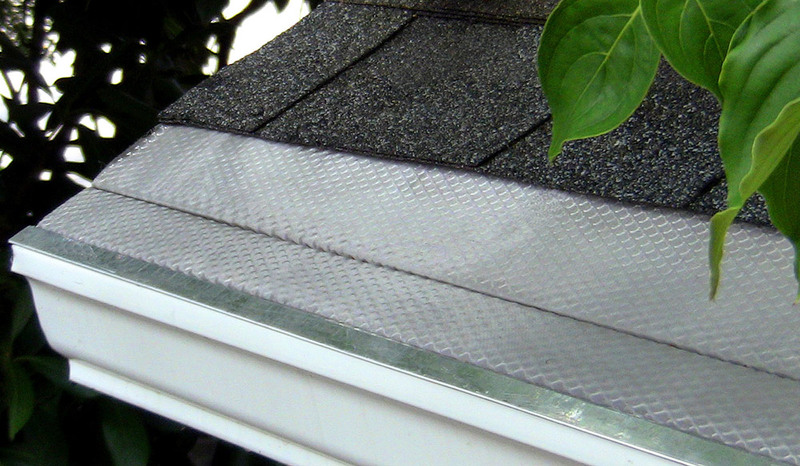 Reverse curve gutter covers can be heated to help prevent ice buildup. Most carry a manufacturers lifetime “no clog” warranty.